There is no point in investing in a big screen if you project a small distorted image onto it. 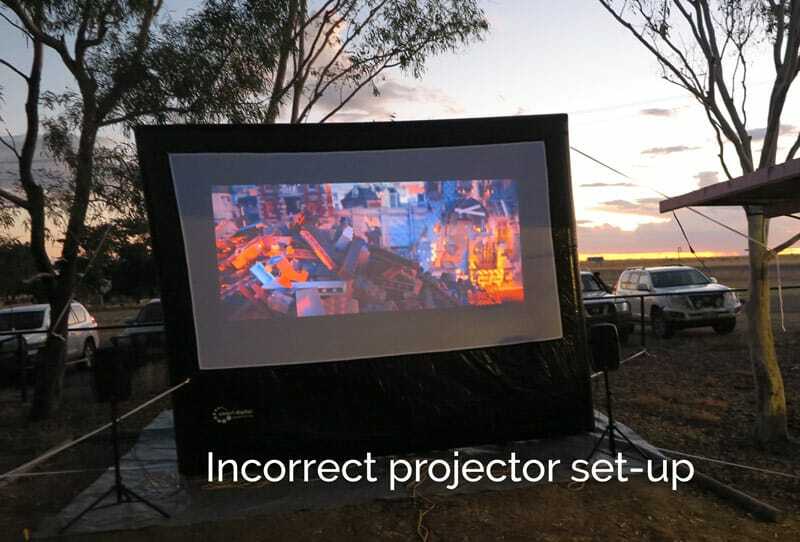 For the slick look of your indoor or outdoor cinema, the image should fill in all the white space of the screen, and marginally get over it (5 mm would suffice), but ideally keep out of the rest of the black screen frame. To achieve it, you need to set up your projector viewing distance and other parametres. This article will guide your setup process. Ideally, the lens of the projector should be in line with the bottom edge of the screen surface. Measure the skirt of the screen and find a coffee table or a trestle table of a similar height, and place the projector on it. We find IKEA side tables are great for smaller screens, while standard trestle tables are great for a 6 m wide screen. Use adjustable legs of the projector to get it to the ideal height. Some cheaper projector models would require fiddling with other objects (coins, DVD covers, books) to get the lens to the right position. 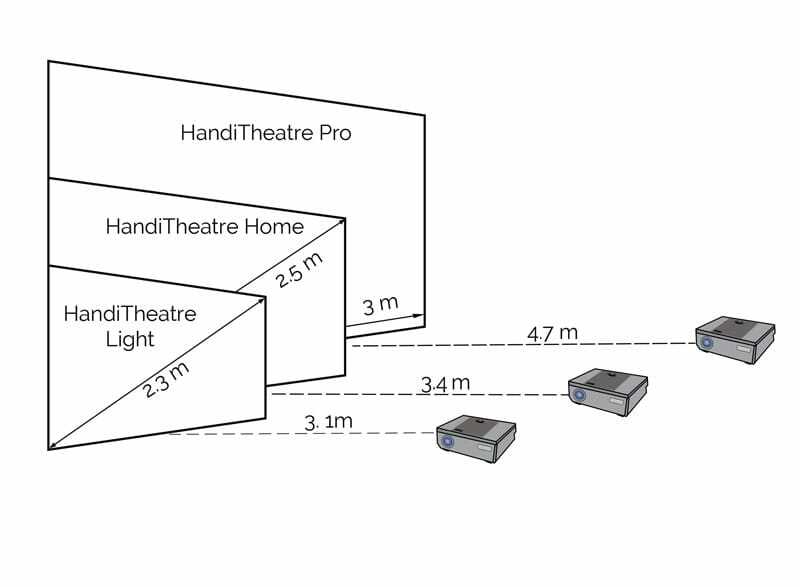 How far away do you need to place the projector from the movie screen? The answer depends on the size of the screen and the type of the projector. 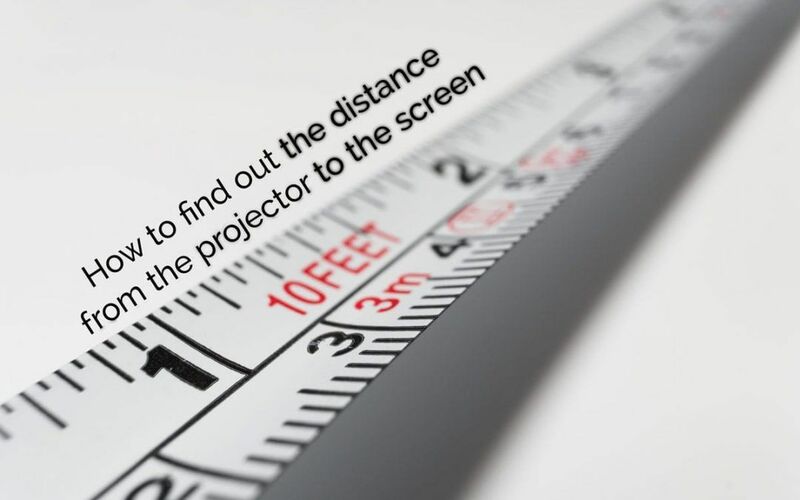 The most accurate way to determine the distance between your projector and the screen is to use a projector throw distance calculator. To use the calculator, you need to know the model of your projector and the size of your screen. Every projector manufacturer offers a throw distance calculator on their website; however, these online tools are not always user friendly and may seem complicated. You can also determine where to place the projector by trial and error, simply moving it closer and further away from the screen. However, if there is a swimming pool on the way, it can be a bit tricky! 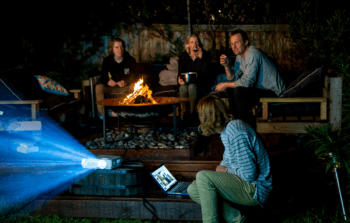 Short throw projector allows you to place it one to three metres from the projection screen. This is great news if your space is limited. Moreover, placing the projector closer to the screen can give you brighter image if there’s a bit of ambient light around. As you can see, the most dramatic gain can be achieved when using a short throw projector with a 6M screen. The data in the tables above is based on using several models and brands of the projectors and is a guide only, but it should be pretty accurate in most of the cases. Line up the projector to the centre of your screen. Even though you will still get the image if the projector is off centre, the image will be distorted. Adjust the focus of the lens to make the image sharp if it is blurry. Zoom control will further help in adjusting the image to fit the screen. Use keystone if your image seems bigger at the top or at the bottom to achieve a perfect rectangle. Now you are ready to hit play, sit back, and enjoy the show! For complete portable indoor and outdoor cinema packages, check our online shop. We supply portable movie screens, speakers, and outdoor projectors of the leading brands with all bits and bobs you need to run a movie night.